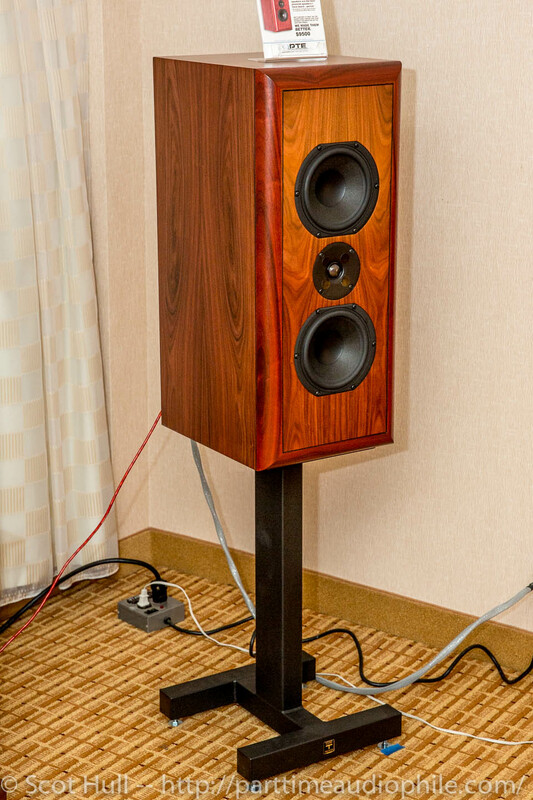 My husband's crush on PTE's Phoenix SG powered speakers ($9,500) is well-documented. I figure it's time for me to go on record and make it clear that I, too, think these are all that and the proverbial bag of chips. 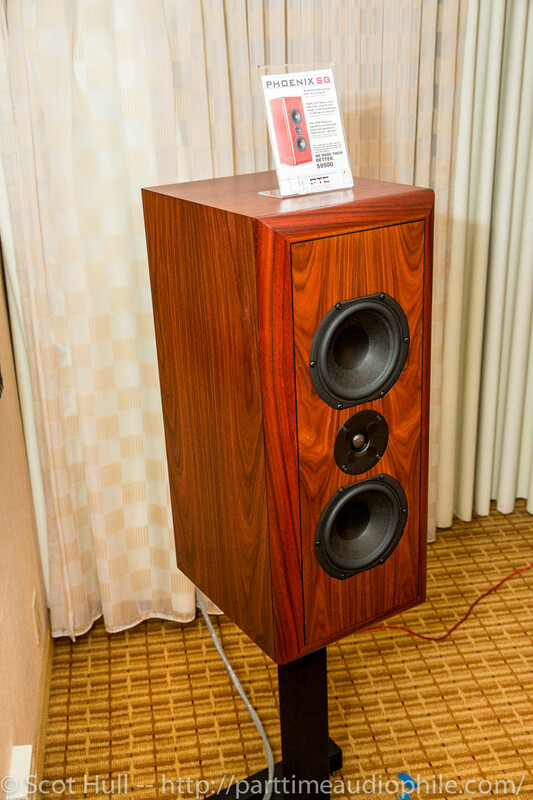 I became a fan of the original Phoenix last year in Newport Beach, although I may have said some disparaging things to Mal about the look of the speaker. "Why can't they be just a little less ugly?" I might have said. My wishes have been answered. The Phoenix SGs, which I first saw at Newport Beach this year, are downright pretty, with superb veneer work and nicely rounded edges. Now that I’ve made the obligatory WAF noises at them, let’s talk sound, which is the real WAF around these parts. There is a definite improvement over the original Phoenix; I noted that the bass seems fuller, but also tighter. In fact, the whole presentation feels tighter to me, with more snap. Janice Ian’s ubiquitous “Walking On Sacred Ground” — if you’ve visited a Soundsmith room, you’ve heard it — startled me with how good it sounded. I’m not really a huge fan of the track, but it’s a revealing one, since on the wrong system I can find it almost intolerably bright. There were no such problems here: the treble had great extension, but no shrillness, and the presentation was liquid-smooth and hugely dynamically satisfying. 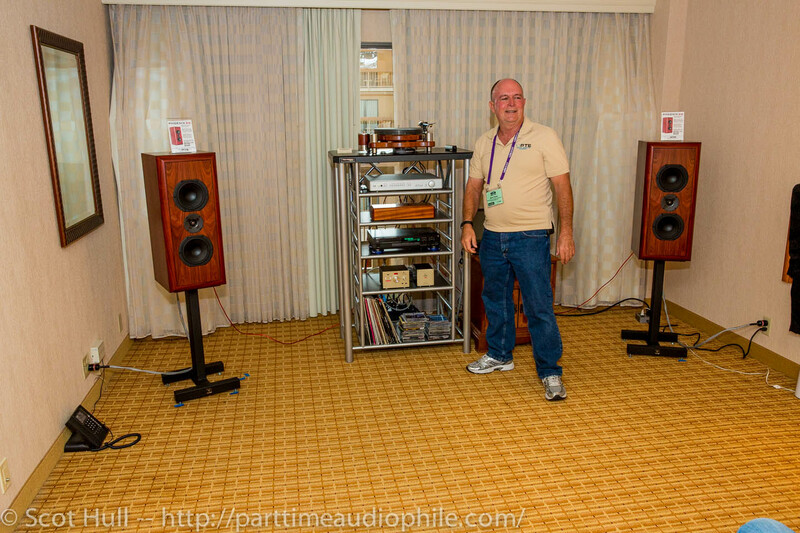 Janice Ian was spinning on a George Warren turntable with Graham Phantom arm and Soundsmith Hyperion cartridge, with PTE’s own phono stage ($1,600) in use. 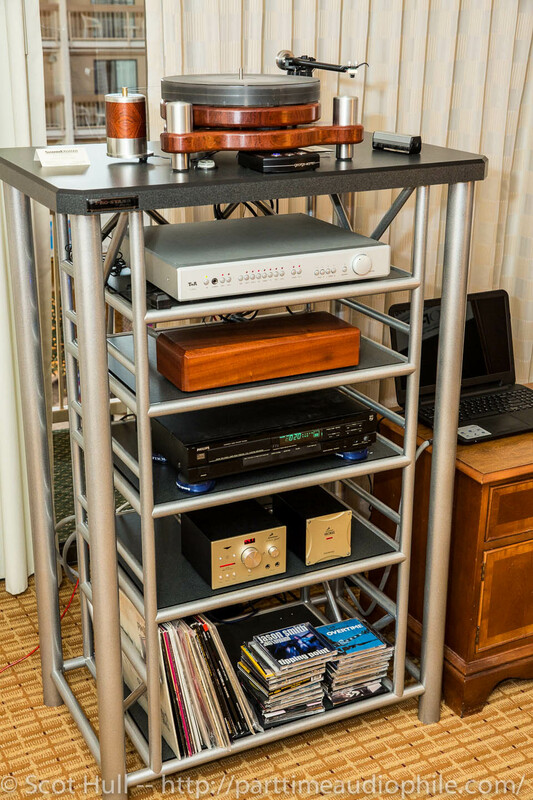 The Antelope Gold DAC ($4,500) and a laptop provided digital. The most important component in the room turned out to be Mark Thoke’s AAA membership card, however; he told me that his van of gear had broken down about 100 miles from Denver, and a call for roadside assistance led to a tow directly to the hotel for unloading before his sad van was carted off to the shop. Talk about the potential for Worst Show Conditions Ever! Wow! Cabinetry made a major difference to the looks! Did these changes enact a price hike!??? $9500!!! Or a typo, of the price of $5900? These were on my short list @ $5900. Hoping they’ll remain so! Al: It seems PTE still offers the original Phoenix at the less-stressful price. It hasn’t changed. The Phoenix SG shown here, though, is definitely the upgraded option. 11,273,202 Visitors ... and counting!